"We are breaking with the past, because we cannot accept its hypotheses. We ourselves are creating our own hypotheses anew and only upon them ... can we build our new life and new world view." The phenomenon that came to be known as Russian Futurism is not an easily defined movement and was entirely separate from Italian Futurism, which was founded in Milan in 1909. As an ideological umbrella, Russian Futurism was intentionally flexible, accommodating diverse artists and practices during a period roughly dated from 1912 to 1916. Distinct collaborative groups of Russian Futurists formed in St. Petersburg and in Moscow, publishing journals, organizing debates, and curating exhibitions of their work. The individuals practicing as Futurists (whether self-identified or identified as such by critics and the press) shared a passion for exploring new modes of expression in poetry, visual art, music, and performance, while also shattering the distinctions between these mediums. Drawing on influences from the West and mingling these with their own Russian heritage, the Futurists celebrated new concepts in psychology, color theory, and linguistics. One of their most unusual elements was a latent archaism, or attachment to Russian traditions in spite of an otherwise overwhelming focus on new technologies and forms. The events of World War I left many artists seeking a profound new meaning for their work and the Futurist vein soon developed into (or was superseded by) movements such as Suprematism and Constructivism. Possibly because Russian Futurism first emerged as a predominantly literary movement, some of its most stunning and original works are experimental books. These collaborations between poets and painters offer its most distinctive legacy, one that can be traced into mid-century sound poetry artworks and Conceptual art. Russian Futurism rejected conventional art methods, proposing a new visual and linguistic vocabulary for modern experience. In their most famous manifesto, A Slap in the Face of Public Taste (1912), the Futurists announced "we alone are the face of our time," and asserted an "insurmountable hatred for the language existing before [us]." They embraced (and inevitably romanticized) the signifiers of the "new": science, technology, invention, and speed. These were general symbols of modernity, but also of a new Russia, leaping out of an agrarian past into an industrial and political revolution. Although they vehemently rejected the past, Russian Futurists celebrated traditional Russian heritage, including aspects of folk life and religion. They drew from a wide range of Russian "primitive" art forms - religious icons and woodcuts, ancient pagan sculpture, folk art and costumes - that they translated into increasingly pure color and abstract forms. Some of the most influential and prolific Russian Futurists were women. Artists including Natalia Goncharova, Lyubov Popova, Olga Rozanova, and Maria Siniakov occupied a remarkable and central role in the artistic movement. Many of these women had traveled or lived outside of Russia, where new ideas about equality were flourishing in international and cosmopolitan cities like Paris and Berlin. Russian Futurists were anti-establishment but did not have a unified political program. Leon Trotsky later called them "cafe artists of the bourgeoisie", though he thought they captured the "rhythms of movement, of action, of attack, and of destruction which were as yet vague" in the pre-Revolutionary period. In December of 1911, the artist and poet David Burliuk and his brothers Vladimir and Nikolai travelled to their childhood home in the countryside to spend their Christmas vacation. In the months before this holiday they had been introduced to the work of Pablo Picasso, and immediately before their departure they had been given a photograph of one of his recent paintings from Paris - a Cubist exploration of a human figure. Eager to explore this new influence, once at home the brothers churned out canvas after canvas, experimenting with multiple perspectives, flattening objects into planes, and using bizarre color combinations in search of something new. Benedikt Livshits, a writer and a recent acquaintance of the brothers, had also been invited to join them on their trip, and he too reveled in the frenzy of artistic experimentation, producing page after page of prose that explored new rhythms in what he considered to be a direct translation of Cubism to the Russian language. Together, the four of them founded a new group called "Hylaea," and banded together to achieve something profoundly new in art. The name they chose recalled the journey of Heracles and the Scythian empire of the Russian steppes, underscoring the group's tendency towards primitive forms and sometimes garish colors which differed from the muted palette of the Cubist trend. It also reflected a proud focus on the members' heritage, the primitive art of their ancestors, and the internal workings of their language. The collective was soon joined by other artists and writers such as Vladimir Mayakovsky, Alexei Kruchenykh, and Velimir Khlebnikov. They would be called Hylaeans for two years before the term "Futurists" was applied to them by the press. In its subject matter and style, Haycutters is indicative of the Neo-Primitivism advocated for by Goncharova and many of her contemporaries, including Larionov and Marc Chagall. In the painting, workers cutting hay are portrayed with an intentionally childlike hand and a simple, modern color palette. Goncharova has relinquished realistic perspective and proportions, painting the workers in the foreground much smaller than the peasant with the scythe in the middle ground. This choice promotes a strong connection between the workers and the wheat behind them. In their height, posture, and even the color of their skin, they appear to be made of the same substance as the hay. A keen sense of motion is created in the painting by the many opposing diagonals: the scythe, the worker's bodies and wheat, and the road traveled by the horse and carriage each carry the viewer's eye in a different direction. Goncharova combined these elements with the heroic scale of the central peasant to create a scene in which farm workers are inextricably linked to the land. 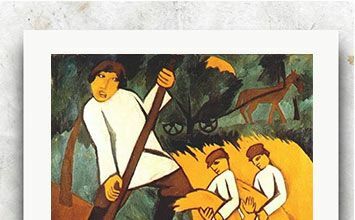 Rather than depicting non-Western "primitive" cultures of Africa, Asia, or the Pacific Islands, the Neo-Primitivist Haycutters celebrates traditional Russian culture and reinforces the fundamental value of the peasant in Russian society. In this way Neo-Primitivism marks an important, specifically Russian, departure from similar styles in Western Europe. A Game in Hell is an exemplar of the ambitious Futurist collaborations between writers and visual artists. Printed entirely by lithograph, including the manuscript text, the book represents avant-garde publishing at its finest. Casting aside the traditional separation of text and image, the experimental language of Khlevnikov and Kruchenykh's poem is fused with Goncharova's bold images in an unmediated, synthetic presentation. Goncharova's depiction of the devil could be interpreted as a profane play on Russian icons and other religious representations, but in a particularly Futurist gesture, her use of traditional Russian iconography remains ambiguous, and could be read equally as an homage to the folk art of her homeland. This exciting alliance between modern literature and visual art would continue to evolve, in Russia and other countries, as early examples of what we now call "multimedia" art. Dyr bul shchyl was the first self-proclaimed zaum poem, published as a part of Kruchenykh's book Pomada (Lipstick) and illustrated in simple lithographs by his friend Mikhail Larionov. Zaum is a compound word best expressed in English as "transrational" or "beyonsense." Its nonsense words and letters are arbitrary, without meaning. The result is a literary work whose effects cannot be anticipated, even by its author. Each time letters of the zaum are read or spoken, they take on a different sound or significance to the reader as well as to any listeners. This was the true intention of the zaum language: to be transrational, to transcend the pettiness of logical thought and exist instead on a higher plane of creativity, even to the point of being beyond the grasp of its author. Just as important as the creativity of a zaum poem's author was the creativity of its reader. Entirely without formal rules, zaum practitioners believed this "language" was universal to all people, thus overcoming the obstacles inherent to languages that must be translated and transcribed in order for comprehension and appreciation to be achieved. Kruchenykh's push toward the basic, abstract building blocks of language was mirrored by Futurist visual artists whose works were also increasingly abstract. Zaum is less well known than the similar language experiments of the Dada movement, though Dada embraced miscommunication and the failure of language. Despite its renowned importance in the history of Russian art, this scene by Goncharova is something of an anomaly among Russian Futurist paintings given its depiction of the action of motion - an approach usually only found in Italian Futurist works. This work layers the Western focus on motion with a distinctively Russian focus on language. Fragments of words have been captured on the canvas indicating the window advertisements of the shops the cyclist passes - silk, thread, hats, and more. However, the cyclist seems to ignore these expensive wares as he pedals doggedly on; he is even directed back from whence he came by a large hand pointing behind him. His difficult journey on cobbled streets reverberates through his body, and the painting becomes a commentary on the state of the working condition rather than a celebration of modern locomotion. While the political aspects of the painting are similar to some of Goncharova's earlier works, its frame-by-frame depiction of movement sets it apart. It exists in-between; neither Italian Futurism nor strictly Russian, it seems to capture the conflict between the two movements. In this typically Rayonist painting, the head of a bull is refracted and disjointed; the animal's eyes are diminished to reflective panes, while his mouth is caught open, freezing his jaw mid-chew. The composition isolates his head, leaving the light's action and refraction around the face as the sole subject of the painting. Not only do we see a multiplicity of angles in this image, but we can also see the animal's current movements (in the motion of his jaw) concurrently with his potential movement, demonstrated by the raking diagonal lines which dominate the piece. Although Larionov's 1913 Rayonist manifesto flatly denounced the West, Rayonism represented perhaps the closest Russian relative of Italian Futurism, combining the Italians' depiction of movement with the Cubists' multi-planar analysis of objects. Indeed, Larionov and Goncharova were among the Russian avant-garde artists with the most direct connection to the West; they both spoke fluent French and eventually emigrated to Paris in 1914. Their departure from Russia signaled the end of the Rayonist movement; although other artists signed the associated manifesto, Larionov and Goncharova were the primary adherents of this visual style and it represented the culmination of their achievements in pre-war Russia. This painting is deeply resonant of the "alogical" style that Malevich adopted as a direct response to the zaum language introduced and explored by Alexei Kruchenykh and other writers in the early 1910s. Alogism centered on a complete reversal of the logic upon which one typically relies when reading a painting; by its backwards rules, the cow and violin that dominate this painting have been chosen purely because they have nothing to do with one another. Similarly, the (relatively) realistically rendered cow undermines the Cubism of the background, pointing toward stylistic and narrative absurdity. Malevich's inscription on the reverse reads: "The alogical juxtaposition of the two forms 'violin and cow' as an element of the struggle against logic, naturalism, philistine meaning, and prejudice" - the artist intentionally ruptures the viewer's attempt to reconcile the two objects. Executed on a recycled table top rather than an expensive new canvas, this painting reflects the artist's struggle with the costs of his trade while also acting as a pointed commentary on the traditions and materials of the fine arts and modern painting. Performed in December of 1913 to the St. Petersburg public, this Cubo-Futurist opera was a shocking spectacle for its audience. Its storyline follows the action of the people of the future as they capture the sun, which represents the decadent past. They tear it from the sky and lock it in a concrete box before giving it a funeral, conquering the natural world with technology. The script, written primarily by Alexei Kruchenykh, relied heavily on the use of zaum, a nonsensical language frequently used by the Russian Futurists as a mode of expression that transcended the restrictions of normal speech. The costumes, designed by Kazimir Malevich, transformed actors into stiff, brightly-colored geometric figures against black and white backdrops, some of which bordered on the abstract in their simplicity. The hectic music, written by Mikhail Matiushin, was played on an out-of-tune piano and sung by amateurs. Fully intended to shock the spectators, this performance is an exemplary expression of the pre-war Russian artistic world at a breaking point, fully rejecting the past and launching itself whole-heartedly into the future. The show's performances likely represented the public's most widespread introduction to zaum language. The significance for Malevich's career cannot be overstated; for the first time, he was not only a mere contributor to a group, but an essential part of a collaborative, multi-media trio. With this collaboration Malevich was able to find his own unique voice, which he would soon develop into his own movement of Suprematism.